Optical properties, in general, measure the absorption, reflectance and transmission of light of varied frequency and wavelength. The testing often utilizes Spectrophotometers to create either graphs or individual data points. Gloss is an aspect of the visual perception of objects that is as important as color when considering the psychological impact of products on a consumer. It has been defined as 'The attribute of surfaces that causes them to have shiny or lustrous, metallic appearance.' The gloss of a surface can be greatly influenced by a number of factors, for example the smoothness achieved during polishing, the amount and type of coating applied or the quality of the substrate. Manufacturers design their products to have maximum appeal- highly reflective car body panels, gloss magazine covers or satin black designer furniture. It is important therefore that gloss levels are achieved consistently on every product or across different batches of products. Gloss can also be a measure of quality of a surface, for instance a drop in the gloss of a coated surface may indicate problems with its cure- leading to other failures such as poor adhesion or lack of protection for the coated surface. It is for these reasons that many manufacturing industries monitor the gloss of their products, from cars, printing and furniture to food, pharmaceuticals and consumer electronics. Different aspects of the gloss of a surface are described by Hunter. Gloss is associated with the capacity of a surface to reflect more light in directions close to the specular than in others. Measurements by this test method correlate with visual observations of surface shininess made at roughly the corresponding angles. Measured gloss ratings by this test method are obtained by comparing the specular reflectance from the specimen to that from a black glass standard. Since specular reflectance depends also on the surface refractive index of the specimen, the measured gloss ratings change as the surface refractive index changes. In obtaining the visual gloss ratings, however, it is customary to compare the specular reflectances of two specimens having similar surface refractive indices. 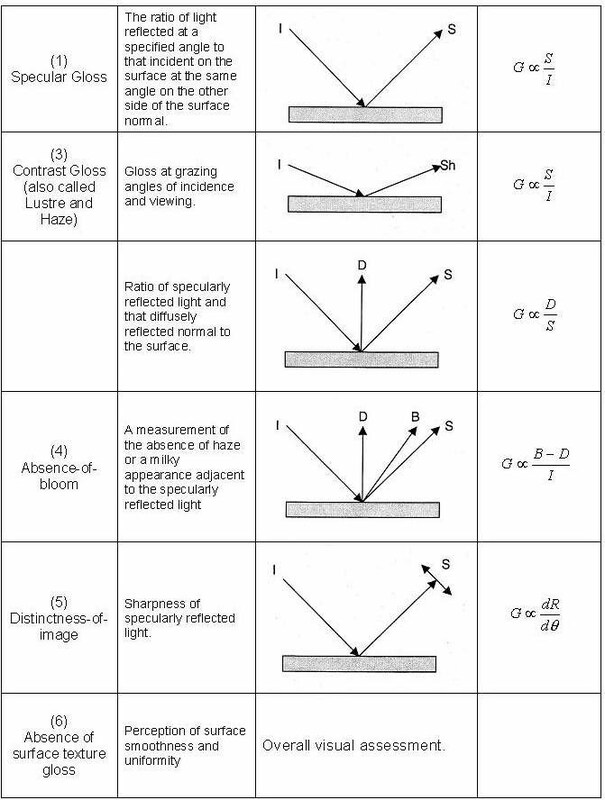 Other visual aspects of surface appearance, such as distinctness of reflected images, reflection haze, and texture, are frequently involved in the assessment of gloss (1), (6), (7). Test Method E 430 includes techniques for the measurement of both distinctness-of-image gloss and reflection haze. Test Method D 4039 provides an alternative procedure for measuring reflection haze. Little information about the relation of numerical-to-perceptual intervals of specular gloss has been published. However, in many applications the gloss scales of this test method have provided instrumental scaling of coated specimens that have agreed well with visual scaling (10). When specimens differing widely in perceived gloss or color, or both, are compared, nonlinearity may be encountered in the relationship between visual gloss difference ratings and instrumental gloss reading differences. 1.1 This test method covers the measurement of the specular gloss of nonmetallic specimens for glossmeter geometries of 60, 20, and 85° (1-7). Yellowness Index is a number calculated from spectrophotometric data that describes the change in color of a test sample from clear or white toward yellow. This test is most commonly used to evaluate color changes in a material caused by real or simulated outdoor exposure. Test sample packaging, handling, and preparation (preferably no cleaning) can affect the test results by modifying the surface of the sample. Since YI testing is often a series of comparative measurements over extended periods of time, these factors should be defined and documented prior to any testing. The BYK Gardner Spectrophotometer is highly automated. After specifying the illuminant, observer angle, and the reference color, the test sample is inserted into the specimen holder, and the spectrophotometer takes the reading. Multiple samples should be measured and the readings averaged. Typically a 4" (100 mm) disk, although any flat sample that the specimen holder will grasp can be tested. Scope:Haze is the scattering of light as it passes through a transparent material, resulting in poor visibility and/or glare. Haze can be inherent in the material, a result of the molding process, or a result of surface texture. Haze can also be a result of environmental factors such as weathering or surface abrasion. Luminous Transmittance measures the amount of light that passes through a sample. Thus haze and transmission measurements can be useful in product development, process development, and end use performance testing. The BYK Gardner Spectrophotometer is highly automated. After specifying the illuminant, observer angle, and the reference color, the test sample is inserted into the specimen holder, and the spectrophotometer takes the reading. Three readings should be taken and the results averaged. Scope:The index of refraction is the ratio of the velocity of light in a vacuum to the velocity of light in a transparent material. The index of refraction can be used to calculate the bend angle of a beam of light as it passes from one transparent medium to another. Thus, the index of refraction is used in designing optical lenses and as a quality control check of transparent plastics. A small drop of contacting liquid is placed on the center of the prism, then the test sample is placed on the prism. The light source, index arm, and compensator drum are adjusted to align the sample through the eyepiece. The refractometer will then provide a digital read-out of the refractive index. Any size that provides a flat polished surface that will sit on the refractometer prism. Typically, 6.3 x 12.7 mm on one face is sufficient. Scope:Hunter Lab and XYZ are standard three dimensional color spaces that allows a precise definition of the color of a test sample. Color analysis can be used to match adjacent parts molded from different materials, or to evaluate color change due to outdoor exposure. Visual color and Spectrophotometer readings can also be affected by surface texture, molding parameters, processing method, and viewing light sources. Before proceeding with this test method, reference should be made to the specification of the material being tested. Any test specimen preparation, conditioning, dimensions, or testing parameters, or a combination thereof, covered in the materials specification shall take precedence over those mentioned in this test method. If there are no material specifications, then default conditions apply. Note 2—Some materials, such as polyamide (nylon), can be cooled very differently during the production of the pellets. This variation in the cooling of the pellets can result in different levels of crystallinity in the pellets only. More crystalline nylons will be more opaque than amorphous nylons. This will result in differences in pellet opacity. The pellet shape is independent of the crystallinity of the material. This variation in pellet appearance, due to varying levels of crystallinity, does not affect final properties. Note 3—This test method should not be used for general material specifications. This test method describes a technique useful for making color comparisons of resins in pellet form that is fast and convenient as it does not require preparation, such as molding or extruding specimens. The test method shall be used only to compare specimens of similar pellet shape, size, texture, and degree of translucency. For example, translucent disc-shaped pellets should be compared to translucent disc-shaped pellets, not with opaque, rectangular shaped pellets. Exact measurements of resin pellet color may not be directly related to the color of the final cast, molded or extruded product due to the multitude of variables, such as producing variables, methods, and pellet shape and size. Color measurements can be useful for comparing resins in pellet form when all samples are similar in shape and size. A three-number tristimulus system is necessary to quantify color completely and precisely. The general method used in this procedure measures color using the CIE Systems described in Practice E308, Test Method D2244, the CIE 1976 (X, Y, Z) system, and, the CIELAB 1976 color space. Individual components of the tristimulus measurement such as CIE Y (Luminance), Hunter L, a, b, or CIE L*, a*, b* values or other useful metrics like yellowness index can be used to describe color attributes of materials. This test method describes a standard procedure on how these measurements are made. 1.1 This test method is intended primarily for the instrumental measurement of the degree of yellowness (or change of degree of yellowness) under daylight illumination of homogeneous, nonfluorescent, nearly-colorless transparent or nearly-white translucent or opaque plastics. The measurement is made on pellets and based on tristimulus values obtained with a spectrophotometer or colorimeter. 1.2 This test method is applicable to the color analysis of plastic pellets. Each material may have unique characteristics that determine the color values. 1.3 This procedure outlines a method to determine color measurements, such as Yellowness Index, CIE X, Y, Z, and Hunter L, a, b, or CIE L*, a*, b*. Note 1—There is no equivalent ISO Standard.